This second grade kit is designed for children in the second grade or functioning at that level. 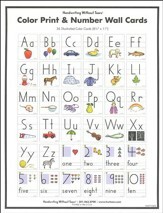 This curriculum is perfect for students who need to practice lowercase letter formation, placement on lines, or spacing; a child who needs a quick review of capitals and numbers; and a child who is writing sentences and paragraphs. This student workbook provides the examples, practices, and exercises for the 2nd Grade student. Lessons cover capitals and lower case letters, which are arranged according to their formation; number instructions are also provided. Lesson plans incorporate letter review with words and sentences, while activity pages combine handwriting instruction with simple writing exercises. 94 pages. Grade 2. Pages are reproducible for the same child's practice and benefit. Pages are not to be reproduced for siblings or others. The Printing Power 2nd grade teacher's guide provides tips and lesson plans that emphasize letter skills, word skills, and sentence skills. There's plenty of information on how to prepare for lessons, stages of learning, instructional stages, a scope & sequence, posture, grip, spacing, and other helpful hints. Lessons include scripted questions, reproductions of reduced-size student pages, multisensory activities, finger trace and check models with instructions, page numbers, word lists, and more. 190 pages, softcover. Double Line Paper solves the problem of line confusion. The bottom line keeps the writing straight and the midline controls the size of the letters. Lines are spaced 3/16" apart. 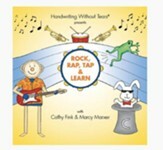 The "Rock, Rap, Tap, & Learn Audio CD" features songs to help develop coordination and rhythm, developing self-esteem and body awareness through upbeat and "rocking" songs. Tracks will help students develop pencil grip and writing posture, as well as letter and number formations. 25 songs and Lyrics booklet included. Teach your students letter formations and placement of letters on double lines with hands-on blackboard activities. Measures 10" x 17". The sets of little sponges and little chalk pieces can also be used with the slate for parents using the Wet-Dry-Try method. 2nd Grade Printing Power Teacher's Guide, 190 pages, softcover. Updated Edition. Printing Power Student Worktext 94 pages, softcover. Updated Edition. Regular Rule Double Line Paper, 100 sheets. 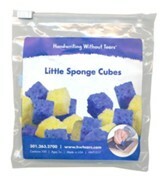 Little Sponge Cubes; cubes are 1/2". 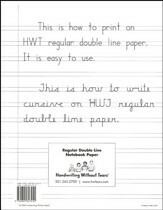 This student workbook is part of the Handwriting without Tears Teal Level C/Grade 2 "Printing Power" level. Lessons integrate other language arts concepts such as punctuation, paragraphs, poems, and language arts into handwriting practice; some activities also include practice writing on single lines. Clever instructions help students understand how to form each word and how it would be placed on the lines. "Learn & Check" features help teachers and students check letter, word, and sentence skills. This new edition features expanded room for writing, accelerated capital letter instruction, more practical application opportunities, and integrated digital instruction opportunities. This workbook is designed to be used alongside the Printing Power Teacher's Guide (not included and sold-separately), which contains the lessons and directions. This curriculum can be supplemented with the Rock, Rap, Tap & Learn CD, Magic C Bunny, blackboard with double lines, color print & number wall cards, print alphabet desk strips, pencils for little hands, double line notebook paper and regular double line notebook paper (all sold-separately). 94 pages, softcover. Page are reproducible for a single child only; copies cannot be made for other children other than the child the workbook was purchased for. Are your second-grade students ready for cursive? The Learning without Tears Printing Power Plus kit includes both Printing Power and Kick Start Cursive student workbooks - a great transition! Printing Power lessons integrate other language arts concepts such as punctuation, paragraphs, poems, and language arts into handwriting practice; some activities also include practice writing on single lines. Clever instructions help students understand how to form each word and how it would be placed on the lines. "Learn & Check" features help teachers and students check letter, word, and sentence skills. Kick Start Cursive introduces children to lowercase letters, connections, and capitals; it offers just the right amount of cursive to help your second graders practice letters, write their names, and set them up for future cursive success in third grade. Printing Power and Kick Start Cursive are both designed to be used alongside the Printing Power Teacher's Guide (not included and sold-separately), which contains the lessons and directions for Printing Power and instructions for the teacher who's beginning to teach cursive. There are not any individual lessons for Kick Start Cursive, but rather general instructions for teachers who are using the book. Kick Start Cursive, 32 pages, softcover. Pages are reproducible for a single child only; copies cannot be made for other children other than the child for whom the workbook was purchased. The Learning without Tears Printing Power program is a Grade 2 handwriting program designed to be intuitive, engaging, and developmentally progressive. Children actively participate in learning through movement, talking, and singing. Lessons take approximately 15 minutes per day and cover posture and grip, capital levels, lowercase letters, words and sentences, and numbers through a variety of multisensory and writing-based activities. Lessons are easy-to-use and include an objective, a lesson introduction, the student workbook page number, QR codes for multimedia elements, reduced-size student pages, and a detailed lesson plan with enrichment, support/ELL notes, and cross-curricular connections at the bottom. The back of the book includes a section with detailed instructions for the multisensory activities. This new edition features updated, unit-based teaching guidelines, updated lesson plans with a streamlined lesson design, simplified teaching guidelines, cross-curricular and school-to-home connections, and optional digital augmentation offerings. Students receive accelerated capital letter instruction, more opportunities for writing practice, and seamless teaching that includes modeling, writing, and music. This journal is designed to be used with the Handwriting without Tears Teal Level C/Grade 2 "Printing Power" resources. This journal is appropriate for second grade students and provides a place for strengthening handwriting and creative writing skills during independent writing time. It includes regular double lines plus space for drawing. 80 pages, paperback.